1. Put the beans in a bowl, cover with plenty of water and soak overnight. to the boil on the hob, then cover and transfer to the oven. Bake for 1 hour. 3. Remove the carrot and celery. I usually just leave the onion. Add the rest of the rosemary, the chopped onion and the garlic. 4. Heat the olive oil in a frying pan and brown the bacon and the pork. Add this to the saucepan as well. Stir in the molasses, mustard, sugar, tomato purée and chilli. Season well. Bring to the boil on the hob again, then transfer to the oven, leaving the pan uncovered. Bake for 3 hours – you might even need a bit longer – gently turning the beans over a couple of times during the cooking time and keeping an eye on the level of the liquid. You want it to reduce so that you are left with a thick mass, not a soupy mixture, but you don’t want the beans to get too dry. 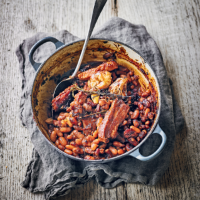 When the beans have an hour left to cook, taste them and decide whether you want to add the cider vinegar – I think it cuts the sweetness very well and adds some depth. In the last hour of cooking it is best to leave the beans so that they get a lovely baked crust on top. 5. Serve on broad, flat soup plates or in pasta bowls. You really don’t need anything starchy with this. The dish is usually served on its own – but I like a bit of Savoy cabbage with it.